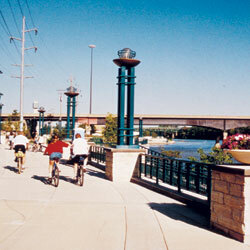 How long is the Mississippi River Trail? | River Action, Inc. In 1823, the first steamboat to pass this point was the Virginia, which was headed upstream to St. Paul. Within a few years, steamboats dominated river transportation, carrying passengers, livestock, and other goods. Steamboats also pushed giant rafts of logs that were cut in Wisconsin and Minnesota and sent downstream to be milled in river towns including Moline, Rock Island and Davenport. By the end of the century, however, competition from the railroads spelled the end of the steamboat era. A few passenger excursion boats continued to operate into the 21st century. One such boat is the Celebration Belle, which provides day cruises from this location. Today, recreation opportunities have been developed here and elsewhere on the Upper Mississippi River. Illinois alone has 450 miles of Mississippi riverfront. Here, along Moline’s Ben Butterworth Parkway, are playgrounds, picnic areas, fishing spots, a marina, and a mixed-use trail . Snaking through the parkway is the Ralph B. Birks Memorial Trail, named after Mr. Birks, who was superintendent of parks and recreation for the city of Moline for 32 years, from 1941 until his retirement in 1972. During his years as park superintendent, he conceived the idea of this parkway and was instrumental in acquiring the necessary land. The trail was dedicated in his honor on Nov. 30, 1995. The Birks trail is part of a national trail system called the Mississippi River Trail, or MRT, which extends from the headwaters of the Mississippi River at Lake Itasca, Minnesota to the Louisiana river delta in the Gulf of Mexico. It is a 3,000-mile system of bicycle-friendly roads and multi- use pathways connecting 10 states. It connects the cities of Minneapolis/St. Paul, St. Louis, Memphis, and New Orleans, along with hundreds of smaller towns along the way. Quad Citians can access off-road trail sections of the MRT for 64 miles from Rock Island all the way to Savannah, IL. The MRT is a unique way to experience the Mississippi River’s natural wonders, transportation system, recreational facilities and cultural heritage. The value of the Upper Mississippi River as a national resource is being ever more widely recognized. The system is vital in supporting ecological systems, commercial navigation as well as recreational activities. A study to measure the economic importance of recreation in the Upper Mississippi River estimates recreationists make over 12 million daily visits, providing over $1.5 billion in national economic impacts and over 18,000 jobs. So enjoy it…the Mississippi is a great place for recreation.